I got your letter today and it is a dandy. The candy you sent me was swell and I liked it very much. am glad to hear that you are better again. There are no blood suckers here but we have some nice big crabs and they can pinch hard enough to make you squel. I am feeling fine and dandy. Well so long. will see you again. I could be wrong, but I don’t believe MN has crabs. Uncle Vic sent two vintage postcards from Maryland; a third from St. Paul, MN. He must have been vacationing on the Maryland coast as there are crabs there. Wonder what he meant by blood suckers. I can be reasonably sure he wasn’t referring to vampires. 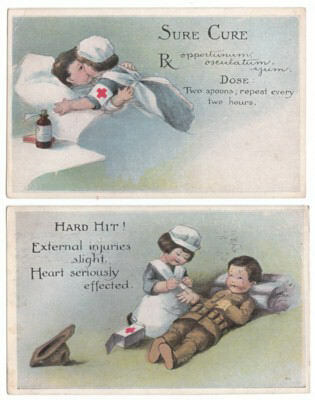 What makes this and the previous two vintage postcards darling, is he addresses the second one “Dear Little Helen”. Uncle Vic is a doting uncle. The message dates and the postmarks are a little confusing. The first vintage postcard was written Sep 3rd, 1918 and posted Nov 4th, 1918 from Maryland. The second one was written Sep 5th, 1918 and posted Nov 9th, 1918 from St. Paul, MN. The third vintage postcard was written Oct 31st, 1918 (Halloween) and posted Nov 1st, 1918 from Maryland. It is likely Helen received the third postcard prior to the second postcard. I am also wondering why Uncle Vic wrote them so far in advance. ** If you found this postcard message blog post amusing like I did, please click on the bookmark link to the lower right. p.s. Vic spelled sqel wrong. It is spelled squeal. 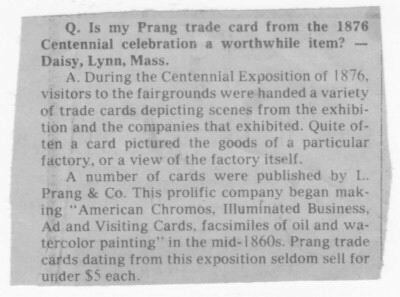 I recently bought a Victorian trade card lot that contained a newspaper clipping in which the following question was asked, “Is my Prang trade card from the 1876 Centennial celebration a worthwhile item?” I was pleasantly surprised the seller included this as information on Victorian trade cards, much less their lithographers, is sometimes very hard to find. I decided to do an internet search to see what I could find out about Louis Prang. Louis Prang was an American publisher who learned colour printing and business management from his father, a calico manufacturer. When the Prussian government banned him for participating in the 1848 uprisings, he came to the USA. Sounds like Louis wanted more than what his father taught him. Louis Prang used what his father taught him in his business, L. Prang & Co. From 1860 to 1897, he built a reputation based on colour printing; particularly large, technically brilliant chromolithographic reproductions of oil and watercolor paintings. For example, Louis Prang supplied the plates for Clement C. Moore’s “A Visit from St Nicholas”. What a cool piece of trivia. Louis Prang was applauded for his aim to provide good, affordable art to the masses. However, this also got him in hot water. He ended up being charged with corrupting public taste by closing the gap between original art, and the inferior substitute (the chromolithographic reproductions). Humm. Why applaud Louis Prang, then turn around and charge him with corrupting public taste? ** If you liked this Victorian trade card blog post, please click on the bookmark button the lower right. 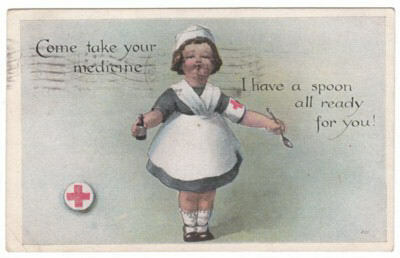 You can find more great Victorian trade cards at Remember When Vintage Postcards.